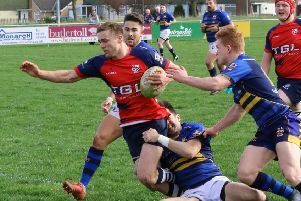 Banbury Bulls did what they had to do to keep the pressure on Old Centralians in Wadworth 6X South West One East. Dan Kirwin and Jack Briggs both bagged a brace of tries as Bulls saw off Trowbridge 62-12 at the DCS Stadium to remain third. Callum Horne was held up but from the resulting scrum the backs switched the ball from one touchline to the other for Kirwin to cross in the corner. Joe Mills kicked out of his own 22 and a mix-up in the Trowbridge defence resulted in a scramble to secure the ball. Mills snatched away possession and ran in untouched under the posts with Duncan Leese converting. Trowbridge replied when Lee Fairclough broke through the Banbury line before off-loading to Wade Loftus who sprinted over in the corner. Banbury’s third try might be one of the best of the season. Bulls overturned the ball in their own 22 and Tommy Gray cut his way through the Trowbridge defence before out-sprinting the covering defence to score in the corner. Gray’s individual brilliance was followed by a superb team try. Justin Parker chipped and chased from his own 22 before shipping the ball on to Leese, who found Kirwin, he released Jacob Mills who got the ball to Briggs who went over. After the restart, Pete Boulton reacted quickest from a line-out to drive through the Trowbridge pack to score in the corner and Ed Phillips converted from the touchline. Leese extended the lead with another score following great work from Briggs who started the move before drawing the last man and Phillips converted. Good breaks from Ian Isham and Leese had the Trowbridge defence back peddling and Callum Horne took full advantage to cut his way through and Phillips converted. Bulls added another score almost immediately when Jacob Mills stole a line-out, Nick Pratt gathered, smashed through the opposition defence before sprinting his way over from the edge of the 22. Trowbridge got their second try with a good move from deep. Loftus broke down the left before off-loading to the supporting Fairclough who crossed the line and Tom Weaver converted. From a five metre scrum the backs switched the ball quickly from one flank to the other and Kirwin dived over. Phillips converted before Bulls scored again in added-time, Leese broke the Trowbridge line and Briggs collected the pass before touching down under the posts. Phillips converted to make it 62-12 at the full-time whistle.